Towering glass kaleidoscope walls twinkle blues, reds, greens, yellows. Patterned pillars guarded at the foot by be-robed bearded figures with fanciful parasols stretch up between the stained glass panels. One wall would be magnificent, but a whole room of light filtered through rainbow stories and symbols brings the humans within to silence. 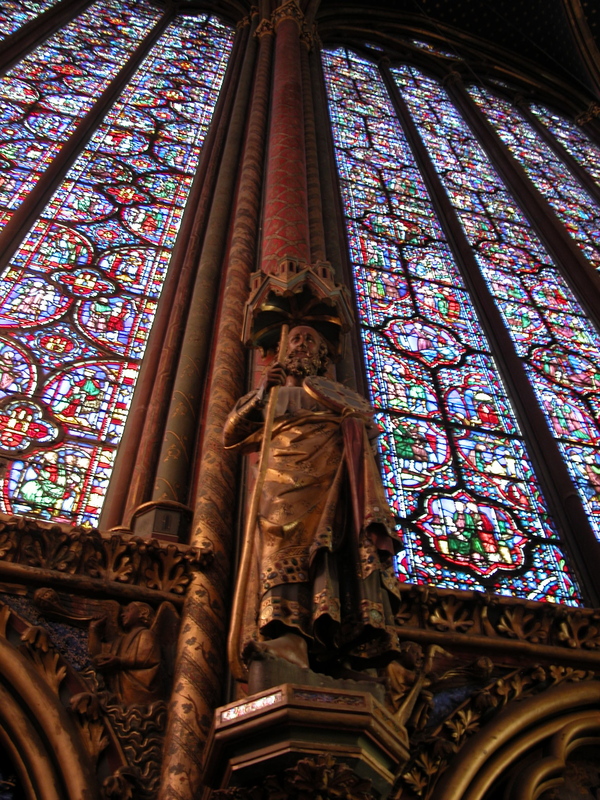 Room is not an adequate word for this building, this Sainte-Chapelle. How should one behave in such a room? Religious or not, the ancient art, the soaring structure, the light, leads you to sit and gaze in awe. In a knowing society, not much strikes us dumb. For a westerner, who feels (or at least feels the illusion of being) in control of their life, their destiny, it is significant to step through a carved doorway and suddenly feel dwarfed and insignificant in the scheme of things. You’re in the presence of a royal chapel that was built in the 13th century and all the gold mouldings and the rainbow light are ancient and grand. On this Île de la Cité in the centre of Paris is this soaring, rich interior that belies its grand but grey exterior. You’ve stumbled on a treasure trove, but not a monetary one, a trove for the soul. Of all the places in Paris that might have been brought to my mind, this is the one that has left the greatest lasting impression, ten years on from my visit. Sometimes when you travel you encounter a series of disappointments: the Mona Lisa is smaller than you imagined; the serenity of the Sistine Chapel is interrupted constantly by broadcasts instructing people to keep moving along; half the Vatican museums are mysteriously closed the only day you’re there. On the other hand, there are places you’d never dreamed about or heard about before that you discover on your adventure. These are the places that lodge in your imagination, that link to positive emotions and are recalled sometimes with a longing to return to that place and time. These are the places you can wax lyrical about given the opportunity, or the opposite: sometimes find yourself without any words to describe the spirit of a place and what it stirred in you. Ten years ago I quit a job that had become stressful and politic-laden and took off to Europe for three months. A friend met me in Rome and we took a small group tour from Rome to Paris, through Switzerland. The tour group wasn’t all we might have hoped, but the places we saw and the stories we shared on our modern day ‘Grand Tour’ were an education. It’s hard not to feel like a cringe-worthy tourist when you’re in a group. A tourist who tramps through monuments, museums and cultures with barely a care or a context. Looking up at a vaulted vivid blue ceiling-sky storeys above you that glimmers with gold motifs you’re no longer a tourist, but a student of awe and wonder. As an avid traveller I really connected with this. I knew the feelings you discussed. I’ve had those myself. More importantly, your writing style is beautiful. Your final paragraph is just perfect. Thanks for reading and for your comments! There is just something about travel, isn’t there? Some of my best memories are just fleeting moments, the light or colours on a building or landscape far from home. Great shot to start off the story with. It’s interesting how different places can make you question how you should act. Theoretically we know how we should be we still question if we have never been in a place quite like it before.